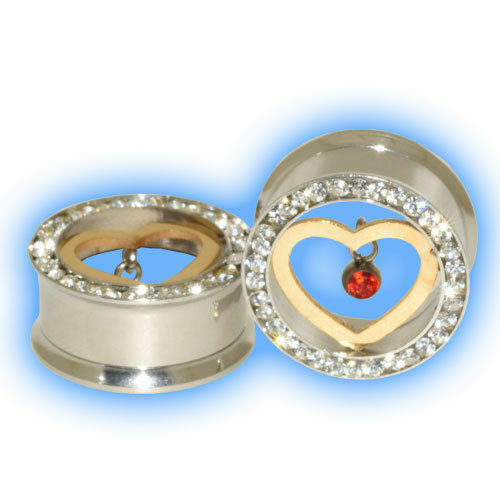 These Steel Tunnels are set with clear gems and the centre of the tunnel looks stunning with a gold coloured cut out heart and a dangling red jewelled stone. The back screws off so that they can easily be inserted into your lobe and the back then screwed on to hold it in place. The price is for 1 plug, if you would like a pair please buy 2. Because they are quite dressy we think that these tunnels would be ideal for a wedding or special occasion like a party or Christmas / New Year celebrations. "Fantastic, been looking for tragus bars with a 6mm bar and tiny balls for a little while. Came across this website & found exactly what I needed...."